Does your Austin commercial property need a strong and durable fence? Look no further than Apple Fence’s wide selection of commercial chain link fences. Whether you need a traditional chain link fence or prefer to customize it to match your business’s aesthetic, we can help. Galvanized chain link fences are what usually come to mind when one thinks about a chain link fence. Why? Because they’re affordable and therefore one of the most popular choices for businesses looking to protect their property. These models are constructed from galvanized iron giving them their silver color and the strength they need to protect your commercial property long-term. Not thrilled with the look of a traditional chain link fence for your business for your Austin business? You might consider our line of commercial vinyl chain link fences. As the name suggests, this fence type takes a typical silver chain link fence and coats it with a vinyl finish. The vinyl coating extends the life of the galvanized iron as it seals the metal and protects it from the elements. This type of fence is popular among commercial properties as the vinyl-coating can be customized to match your logo’s colors or your business exterior. One of our recent vinyl fence installation projects was for an Embree Group property in Dripping Springs, Texas. The commercial property featured several ponds which could have posed a hazard to passersby. Understandably, they wanted a quality chain link fence that could withstand the elements and provide sturdy, long-lasting protection. The client decided on a tall chain link fence coated with black vinyl, providing the protection they were looking for without compromising style. Most people believe choosing a chain link fence for their business means forfeiting privacy. With the addition of a screen, however, the opposite is true. 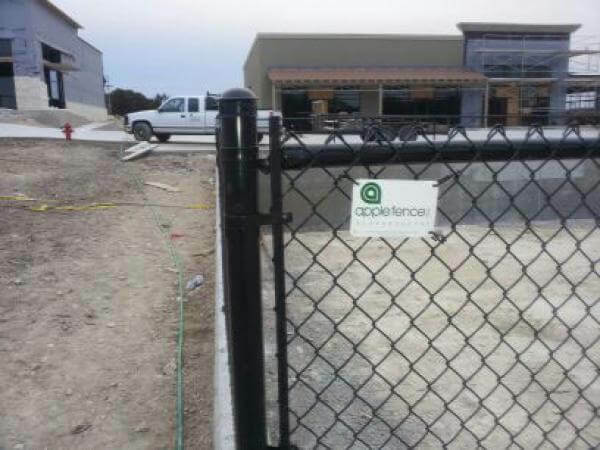 Recently, for example, Austin Capital Concrete decided to harness the strength of a galvanized chain link fence with the privacy of a solid fence. By adding a screen, our commercial client obtained a durable fence that still provided privacy for their large property. If you’re an Austin business owner looking to install a fence on your property, we have a solution for you. Give us a call to discuss your commercial chain link fence and how you can customize it to suit your needs, or request a free quote online.